Are you ready for your close-up? Having a video of yourself on your author website home page will increase the length of time that a visitor spends on your site. A video will help build a sense of trust between you and your audience. When fans feel they know you—consider you a friend—they’re more likely to come back, sign up for your email list, and buy your book. If presented in a fun way, your video may even go viral and spread your author brand all over the Web! And creating your own video for your website is easier than you might think. 2. Start Recording. There’s no need to spend a small fortune on professional-grade video recording equipment. The easiest way to record your video is to use your computer’s built in webcam and microphone. Simply sign into your YouTube account, click Upload, and in the Create Video section, select Webcam Capture. Or you can use your smartphone to take the video and then upload it to YouTube. You may want a friend to help hold the smartphone for you and press record—or you can prop your phone up on a shelf. 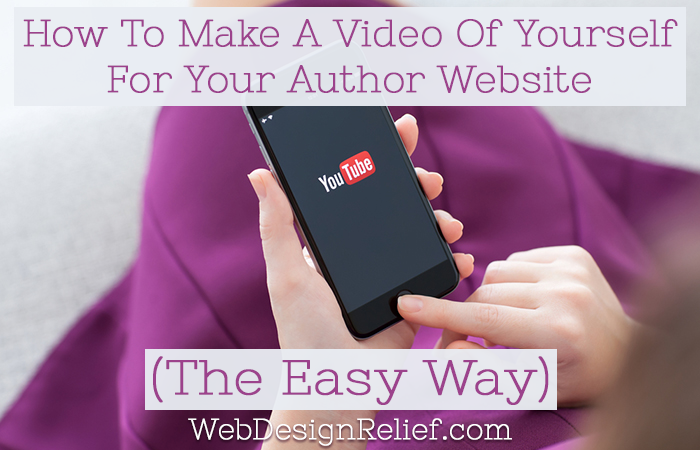 By using YouTube and then linking to your author website homepage, your video will have better upload speed. 3. Set Your Scene. Background scenery can help set the mood and tone of your video. You want a setting that conveys who you are as a writer. You could record your video at a bookstore (with the owner’s permission), at your writing desk, or even out in a public park. Just make sure there isn’t too much hustle and bustle around you or your fans won’t be able to hear all you have to say. 4. Test Your Lighting. Once you’ve chosen your scene, make sure to have ample lighting. Most cell phones that capture video cannot simultaneously maintain the flash during filming. If you’re shooting outside, make sure to do so on a sunny day (with the sun behind the camera). If you’re shooting indoors, test a number of different lamp configurations until you get it right. Sometimes, natural light is your best option. 5. Shoot Your Video. Don’t be afraid of multiple takes—it’s okay if you don’t get it right on the first try. The beauty of digital recording lies in its infinite do-overs. Once your video is recorded, you’ll be ready to share your story with the world! While you want to maintain a professional demeanor, you also want to seem friendly and approachable. If you come across as stuffy or standoffish, it may give potential fans the wrong impression. Some of the most successful videos are those that are fairly low key and conversational. Keep in mind: What is your author brand? What are your motivations for writing? Then, just talk to the camera and answer these questions: You’ll be able to perform with ease. Remember, you can rewrite, relocate for a better background, and re-record until you have a video that truly captures the “write” you. QUESTION: Have you ever made an introductory video for your online author platform?